Unicorn Dreams Wholistic Touch - Equine Bodywork Frequently Asked Questions"A horse gallops with his lungs,Perseveres with his heart,And wins with his character." ~ Tesio Keep up with us on our Blog! Massage is the manipulation of the muscles, tendons, ligaments and tissues of the body. It also supports and resolves issues in the musculoskeletal system. 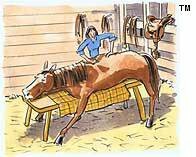 The same techniques used in human massage are applied safely and effectively in equines. 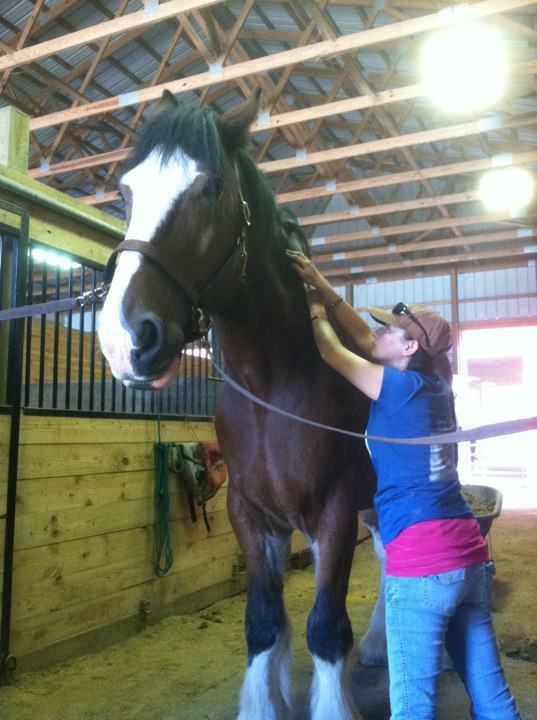 Massage is a natural method of managing your horse's health and prolonging quality of life. An average session lasts anywhere from forty-five minutes to an hour and a half. Additional time may be needed in certain situations. I like to visit with the rider and/or trainer at the first session. With some horses I do need a handler to help. Most of the time, once your horse and I get to know each other, it is easier for both of us to be left alone to "do our thing." What does a Body Work Session include? I will typically work the whole horse paying extra attention to any problem areas. Stretches may be included. I may recommend "homework" to do with your horse to help support the work done during the session. This depends on your horse. His conformation, training level, condition, history of injuries, tack fit, and rider ability all play a role. In an ideal world, we would all get a massage at least once a month. Generally, that is a good maintenance schedule to keep with a horse. More frequent sessions may be needed if training for competition, or a heavy workload is part of your horse's life. Can I ride my horse after the massage? Follow-up exercise helps your horse integrate the changes to his muscles and range of motion that come from a session. Turn-out and light riding is recommended following a massage. How is this different from a chiropractor working on my horse? My focus is on the muscles, fascia and soft tissue. Often times, when imbalances and restrictions in the soft tissues are released, the spine is able to return to its proper position. Additionally, if you are choosing to have a chiropractor out to adjust your horse, you may also want a bodyworker to come out before and/or after the adjustment. I have a competition with my horse this weekend. He hasn't had body work or massage work done before. This will really help me at the competition, right? Once we are on a regular schedule, yes it will be a great idea to have me work on your horse prior to competing. However, the first session may change your horse's way of going. You want to allow him time to adjust. Please schedule me at least a week, out from any competitions, to allow both of you to adjust to the results of the session. Please contact me with additional questions.